As someone who dislikes theme parks, the only reason I wanted to go to Islands of Adventure in the first place, as I stated in a previous post, was the visit The Wizarding World of Harry Potter. So I was surprised to discover that outside wandering Hogsmede and basking in the glow of Hogwarts, I actually enjoyed the entire park, not just the Harry Potter part. I loved Seuss Landing. Even though I'm not a little kid, walking around that part of the park made me feel like I was walking inside an animated movie. 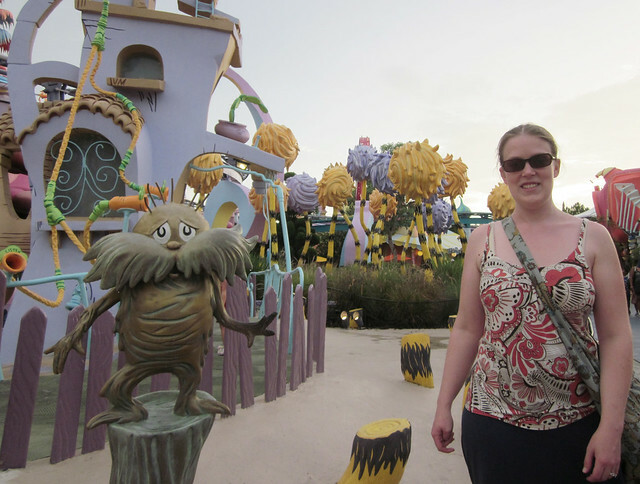 Plus, I loved walking among the truffula trees and getting to see The Lorax. The Wizarding World of Harry Potter can definitely get crowded, but from my observation, it is most crowded first thing in the morning and in the early afternoon. By 3:00 people started thinning out quite a bit. I greatly appreciated the efficiency of the dining room at The Three Broomsticks tavern in the WWOHP. It was cafeteria style, but they had strategically placed workers with walkie-talkies throughout the dining room to help find seats for everyone. For someone who doesn't like rides, I actually found myself quite impressed with what Islands of Adventure had to offer. I had three favorites: The Amazing Adventures of Spider Man (it used the same technology as Harry Potter and the Forbidden Journey but it was BETTER), the dragon challenge roller coaster (part of my love for this ride is its lack of a line the entire day), and the Incredible Hulk roller coaster. The Incredible Hulk coaster was nothing like any roller coaster I've ever been on. Usually you think of riding a roller coaster where you inch up the first hill slowly and then descend quickly down the hill. The Hulk coaster, however, starts inching you up for a couple seconds but then just shoots you straight up the hill at top speed. It was AWESOME! I had to ride it twice. Universal has a very cool locker system. In order to ride certain rides you can't take bags with you so they have strategically placed lockers outside these rides. In order to lock and unlock the lockers, you use your fingerprint on a touch screen! Very space-age. Overall, my assessment of Islands of Adventure from someone who usually hates theme parks is that it was worth the trip. I'd go back for the butterbeer alone - and to ride the Hulk coaster again.